Looking to fill out your family tree? Go to the Digital Roots Relative Finder site, a database of several million dead and living persons, and their relationships to one another. Create a user account for yourself and a "group" under which to store the persons found in your search for relatives. To start your research, you need at least one Ancestral File Number, a number used by genealogy data gatherers worldwide to uniquely identify a person's relationships record. You can look up the AFN of a deceased relative known to you - i.e., a grandparent - at Family Search. While you're there you can download free genealogy software to keep track of all the family connections you will find! Enter the name and AFN of one of your known ancestors in the Digital Roots Relative Finder query page, and it will give you a report of famous ancestors, saints, royalty and other figures from your family tree. But that does not tell you who is alive and related to you today, does it? The "famous" reports may include celebrities who are living now, but the vast majority of results will be long-dead ancestors. There are simply more people dead than alive! But with these ancient ancestors come their AFNs, and from those you can trace their descendants to the present day... to some degree. The closer you come to the current time, the less inclusive genealogy databases tend to be. There's simply a lag between births and their entries into genealogy databases. At the other extreme, the further back in time you go the sparser the records of your ancestors will be. That's due to antiquated records that may have been destroyed in fires, floods, etc., or simply not discovered yet by genealogists. Many people are surprised to learn how many famous relatives they have, or that they are much closer to the throne of some monarchy than they ever imagined. Sometimes genealogy produces ironic results. In July, 2009, a white police officer named James Crowley arrested a black Harvard professor named Henry Louis Gates, Jr. The incident touched off a firestorm of racial controversy that ended with the two men sharing beers with President Barack Obama in the White House. That was wild enough, but the best was yet to come! A diligent journalist discovered that these two adversaries are related - distant cousins connected by a common Irish ancestor named Niall "of the Nine Hostages." Niall lived in the 4th Century, and created the foundation of Irish genealogy because he had so many offspring to keep track of. I should also mention DNA testing for genealogy. The advancement of study into human DNA has revealed that DNA can be used as a tool for determining ancestry. It turns out that DNA is passed down through the generations, leaving telltale markers of family relationships that can extend back a thousand years. A simple DNA test can show whether two people are related, if they are descended from a common ancestor, and can even give clues about future potential health risks. Services such as 23andMe, Ancestry.com, and many others offer DNA testing for a fee. Most recent comments on "How Can I Find Out Who I Am Related To?" But in Islendingabok I can check out any other Icelander and see how I am related to him/her. Almost all of us are related to each other, some distant, some close. It's brilliant! parents: alexander williams; Mamie H whitehead both born 1913 marion al. No thanks. I don't want the Mormons having any of my information. 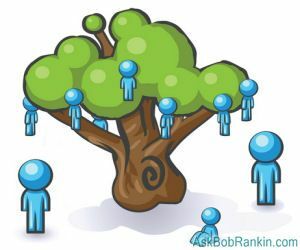 It would be nice to have a genealogy group without the religious intonations and who will ultimately use the information to their advantage. EDITOR'S NOTE: I'm not a Mormon, but it's always been my impression that the LDS church was doing a good thing by offering their genealogy databases online for free. Do you have any information that might suggest otherwise? Does the LDS church, whose information the above draws upon, then collect the information one inputs in order to extend the data base? Any way to find out? Do they have a site in Europe for people that lived in Eastern Europe ( Romania)? Just tried it, it want's my "new.familysearch" ID, but that is only being given to LDS members.. You need to update your page. EDITOR'S NOTE: Do you mean FamilySearch.org? I just did several searches there and it didn't ask me for anything like that. Digital roots family finder. When I try to access the link you have I get nowhere.